A slightly edited version of this article is here in the Tasmanian Times. Dr Nelson’s speech reported in the Launceston Examiner. The Tamar Valley Peace Festival is becoming a significant community event in Launceston and Tasmania, and should be supported. At a time when our country is seeing its biggest increase in defence spending since World War II, and our government is using public money to establish Australia as a globally significant arms exporter, it’s a critical time to reflect on peace and ask hard questions. Two years ago, guest speaker at the Peace Festival, Julian Burnside, finished his oration by saying there can be no peace without first having truth and honesty. 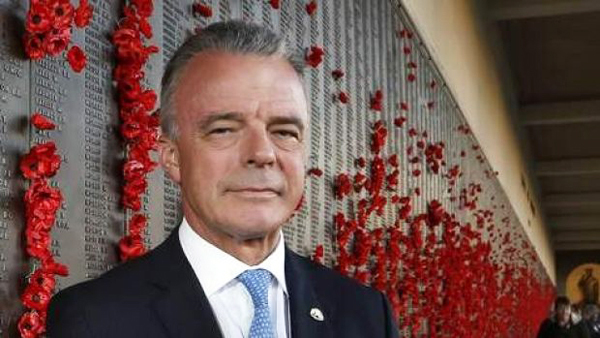 This is an important narrative to consider in light of one of this year’s guest speakers, Dr Brendan Nelson, Director of the Australian War Memorial. Understandably to some, Dr Nelson’s invitation to speak at a peace festival may appear political or provocative. After all, Dr Nelson was in the Coalition Cabinet that signed off on the invasion of Iraq in 2003, telling the public that we had to go in with the United States and Britain and stop Saddam Hussein’s regime using weapons of mass destruction. This was an illegal invasion based on a lie. On painful reflection, history also tells us that this action destabilised the region, contributing to the rise of Islamic State and consequent long-running civil wars in Iraq and Syria, catastrophically leading to the flow of millions of displaced refugees and the deaths of hundreds of thousands of innocent people. It’s important that those in search of truth and peace make the most of the oration by Brendan Nelson by asking him some hard questions. Not just about Iraq, but also, given his current job, about the future of the Australian War Memorial. So, if you are planning to attend the speech by Brendan Nelson, here are ten questions I feel need to be asked and answered. You may well come up with many of your own. One: Andrew Wilkie blew the whistle at the time of Australian Cabinet deliberations into the invasion of Iraq – on the grounds that there was no evidence of weapons of mass destruction. This turned out to be the case. What are your recollections of this matter at the time? Did you and your government mislead the Australian people on this matter? Two: Andrew Wilkie has openly stated that, in his opinion, some ministers in the previous Howard Government have ‘blood on their hands’ over the invasion of Iraq? Do you accept or reject this characterisation that could apply to you as a key decision maker? Three: Do you personally now regret the decision you took to commit Australia to this war? If not, why not? Four: The findings of the UK Chilcot inquiry into the decision-making process around the UK government’s role in going to war with Iraq were damning, indeed chilling. Do you support a similar inquiry in Australia? Why haven’t we ever had such an independent inquiry to hold decision-makers to account? Five: Do you support ‘War Powers’ reform that gives the initial decision to commit Australian Defence Force personnel to a conflict to the parliament, rather than the executive? If not, why not? Six: Australia has been engaged in military operations in Afghanistan since 2001, longer than any other military conflict, with no end in sight. You have been a defence minister during this conflict. What is the exit strategy for this conflict? Do you see an end in sight? Seven: As Director of the Australian War Memorial why do you take donations from weapons companies that profit from war? Do you understand why some people are offended that you allow weapons manufacturers to book the memorial for their official functions, such as grand opening parties? Eight: Why shouldn’t the Australian War Memorial have an exhibition on our Frontier Wars? You have been outspoken in your opposition to this in the past. Nine: Isn’t promoting an Operation Sovereign Borders exhibition at the Memorial an attempt to normalise and politicise a highly controversial and divisive government policy, in breach of the International Refugee Convention? Were you surprised when you were criticised for proposing this? Ten: Veterans’ groups and senior ex-military leaders have criticised significant recent funds going into upgrading the Australian War Memorial when veterans’ groups are struggling for funds for mental health initiatives and shelters for homeless veterans. How do you respond to these criticisms about this government’s priorities? These are just some questions I have for Brendan Nelson. You might have others you want to ask, and we can all reflect upon the answers. That is what I think a peace festival should be about. ‹ Douglas, Bob: What will it take to restore governance to its rightful owners?